After I've done with the PLARING,I flip the mag over...'n over again. 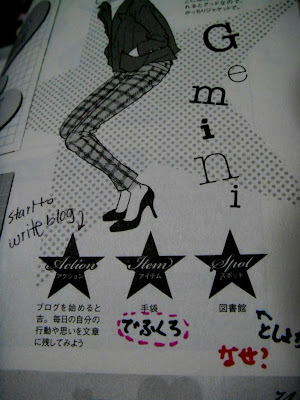 As my [ACTION] star, I tells 'You should begin your blog, and try to write about it as often as you could'.."Oh! that's true...I have do it before I read this"..Is it a good sign?? LoL!! My Intiz' Journal is getting fatter with the papers,notes,sticky memos..blah..blah..blah!! The place where Gemini should go:::LIBRARy..I wonder why?? But actually I'm not going :::cuZ my bedrom has many many magazines to read...Fashion Trend Center where use to be the biggest fashion library in Bangkok..Sadly it has been closed...Internet is a huge source...Anyway..That's what Gemini is all about! !